This Irish Stew is fantastic. The Guinness adds a nice richness. Make sure to check out our Irish Soda Bread to go with it. 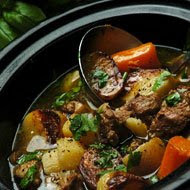 I love this Irish Stew and I can not wait to make it this year. It is one of the few things that the whole family loves. The main difference between this recipe and others is the Guinness and the Marmite. Marmite can be found in most grocery stores these days. If your grocery store has a section with import goods then it probably has Marmite. I have never really had trouble finding it. It adds to the richness in flavor and can be used in other dishes that has a beef based sauce. There is no meat in it but it has a beefy flavor. brown. The browning adds a lot of the flavor. burn and stir it from time to time. enough flour to completely coat. The flour should look dry. slow cooker. Continue until all of the meat is browned. until they start to brown. flavor. Mix in the Marmite. leave the peel on. Put them all in the slow cooker. simmering stock, into the slow cooker for at least 3 hours. Oh my just look at all of the neat stuff I missed because of my internet being down. Thank you so much for continuing to drop by!! The stew looks great I will give it a try. I love stews! Especially during family get together. I love how the flavor of the meet blends well with the vegetables flavor. My mother has this specialty using beef, tomatoes, butter and cream. The cream tones down the tomato flavor.